Kitchen cutters are expensive. Just because your old cutters are dull doesn’t mean you need to toss them in the trash. This professional and portable design works on all types of cutter blades, unlike a standard electric cutter sharpener or sharpening steel that only accommodates a couple of different blade types. 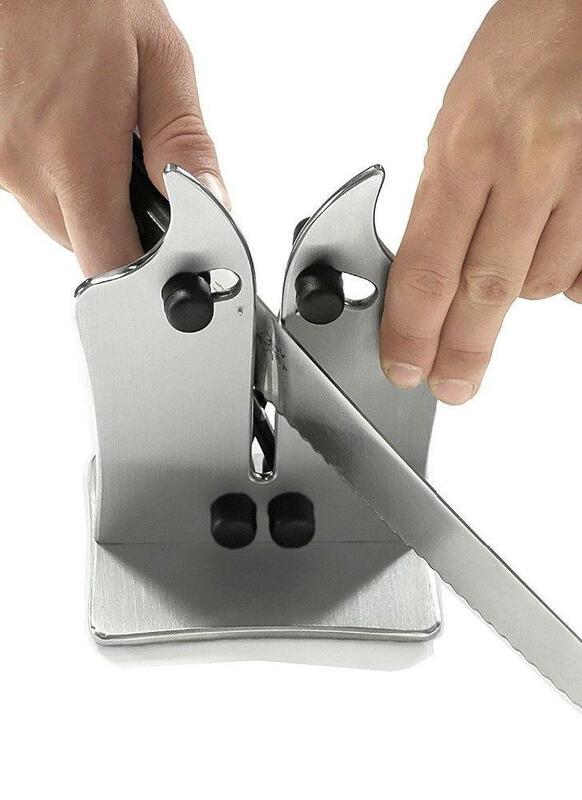 It sharpens all your dull cutters in seconds, unlike an electric cutter sharpener or sharpening steel that only sharpens a couple different types of blades. Features two independent spring-action arms made of tungsten carbide that contour to your cutter's edge better than a cutter sharpening stone. Sharpens, hones, and polishes your old cutters – give your chef cutter and butcher cutter a makeover. Professional and portable cutter sharpener works on all types of cutter blades, like standard, serrated, and beveled.